Is there information on how to combine HO EZ Track in combinations to go from 2 tracks to 3 tracks to 4 tracks to 2 tracks or any other combinations. Trying to run similar NYC MTA Subways. This might help you a little in figuring out some geometry with standard turnouts. I'm not sure if this is what you are looking. I don't have any specs or pics with larger turnouts. If you're looking to run tracks close to each other like on a subway, your best bet would be to use track without attached roadbed so you can cut and splice them yourself. Terry, Thank You, this helps and gives me a few ideas I already have and can convert with what is shown on the siding tips. Here are some other off the wall configurations I had forgotten about. I was working on this site many years ago and it fell by the wayside. 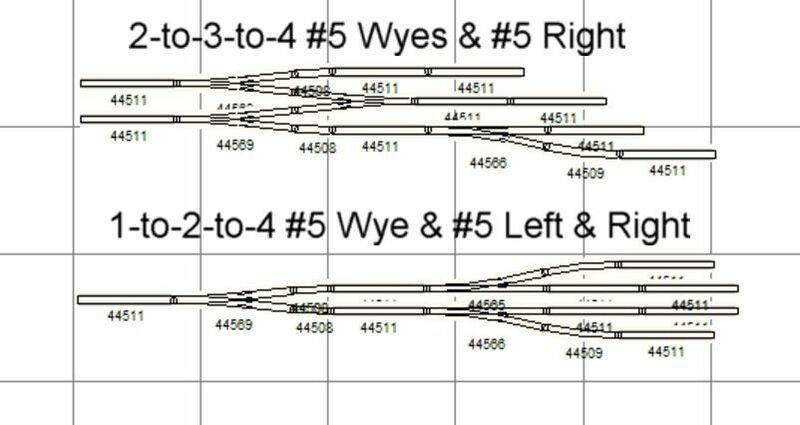 Forgot to mention, the 9" straights between the Wye and Left/Right turnouts in the lower diagram are to minimize the 'S' curve effect on long passenger cars tranistioning from the single track to one of the outter turnout tracks. A shorter straight can be used if you'll only be running shorter cars. This is what I needed. You and Len will make me look great for the grandchildren this holiday season. I know about pleasing those grandchildren. That's one of the reasons I do mine every year. 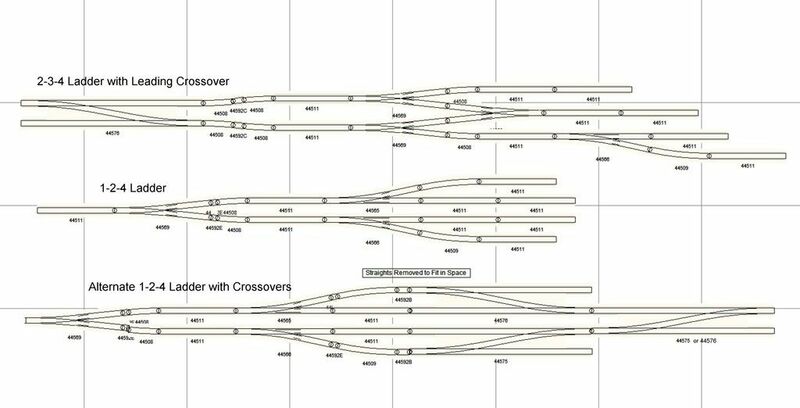 In your 2-3-4 example, is there a way to connect a #6 crosssover to the "2 track" end of the two 44511? It can be done, but it introduces a couple of shallow 'S' curves into the mix. I'm having problems getting Photobucket to take uploads right now, so I can't do a pic yet. Basically what you do is add a 44508 curve to each side of the crossover that will be facing the '2' end of the ladder. You want them to flair outward from the crossover. Then add a 1-1/4" straight (44592) to the end of those curves and another pair of 44508 curves coming back in to connect to the '2' end of the ladder. If Photobucket starts working again, I'll see about posting a pic. It's actually easier, and doesn't have the 'S' curve issue because only short straights are needed, to add crossovers to the right end of the 1-2-4 ladder. Because of screen size limitations I had to remove some of the straights between the #5 turnouts and the #6 crossovers in the 'Alternate 1-2-4 Ladder' diagram to get it to fit the page. You could use whatever additional straights will fit your layout space in that area. Len, Thank You, that is exactly the info I need.